The Mayo ladies remain firmly in the hunt for the semi-finals of Division 1 of the Lidl Ladies NFL, thanks to a five-point win over Donegal this afternoon at the Swinford Amenity Park. Defensive systems went out the window early doors with Mayo in particular dominating the opening exchanges. After both sides traded early points, Mayo found another gear and they raced into a five-point lead by the eighth minute thanks to a Fiona McHale goal, after receiving a pop pass from Grace Kelly. However, for all their dominance Donegal were still hanging in there thanks mainly to the exploits of Geraldine McLaughlin, who was back from injury. Fiona Doherty and Sarah Rowe fired home for Mayo in the 10th and 12th minutes respectively, but Donegal were slowly finding their feet and Geraldine McLaughlin gave them a focal point up front. McLaughlin sent a looping effort past Elaine Murphy, and in the 15th minute the Termon sharpshooter palmed home after the Mayo custodian spilled the ball in the greasy conditions. This pared the deficit to a manageable four points, after Mayo’s early dominance. Fiona Doherty added to her tally, but Donegal were back on level terms thanks to a quickfire 1-2. Geraldine McLaughlin glanced over a beauty, with Aoife McDonnell following suit in the 17th minute. Then, after a flowing move Ciara Grant beat Murphy with a crisp strike. Grant and Doireann Hughestraded further points to leave the sides deadlocked for the fourth time in the opening stanza. Aileen Gilroy who impressed all afternoon and Donegal skipper Karen Guthrie added late points deep into injury time, after Mayo lost goalkeeper Elaine Murphy to injury. Grace Kelly edged Mayo back into the ascendancy on the resumption, but Donegal pounced for 1-1 in the space of three minutes, with Niamh Hegarty applying the killer strike after creating a three-on-one overlap inside. Mayo regrouped after that setback and the Kelly sisters nudged them back in front with Niamh Kelly rifling home after she cut inside. 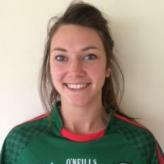 Ciara Grant left the sides deadlocked for the sixth time in the 43rd minute, but Mayo pushed into another gear. Fiona Doherty whipped over from distance, and moments later Sinead Cafferky finished emphatically after a penetrating run from Fiona McHale. Geraldine McLaughlin kept Donegal in touch, but a brace of singles from Shauna Howley and Sarah Rowe stretched Mayo’s lead to five points. McLaughlin and Aileen Gilroy traded late points, with Donegal’s Niamh Hegarty flashed a yellow card by referee John Gallagher in the dying embers of this hugely entertaining affair. Grace Kelly capped off a superb afternoon for Peter Leahy’s charges, who welcome Monaghan to Swinford next weekend in the refixed contest, knowing that a win will guarantee a semi-final spot. Scorers for Donegal – G McLaughlin (2-5, 4f), C Grant (1-2), N Hegarty (1-1), K Guthrie (0-2, 1f), K Herron (0-1), A McDonnell (0-1). Mayo – E Murphy; N O’Malley, S Ludden; O Conlon, E Lowther, D Hughes; C McManamon, A Gilroy; F McHale, F Doherty, S Cafferky; N Kelly, S Rowe, G Kelly. Subs Used – S Murphy for E Murphy (23 mins, inj), R Flynn for N O’Malley (ht), D Caldwell for E Lowther (39 mins), S Howley for F Doherty (44 mins), N Moran for C McManamon (52 mins). Donegal – R McCafferty; T Doherty, N McLaughlin, E Gallagher; B McLaughlin, C Hegarty, A McDonnell; K Herron, G Houston; K Guthrie, N Hegarty, SJ McDonald; C Grant, E McCrory, G McLaughlin.Subs Used – AM McGlynn for E Gallagher (ht), E Ward for AM McGlynn (54 mins).